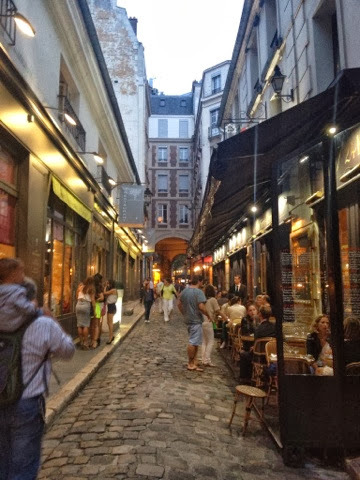 We stumbled upon La Jacobine down a narrow cobblestone street in the 6th Arrondissement filled with endless bars and bistros. 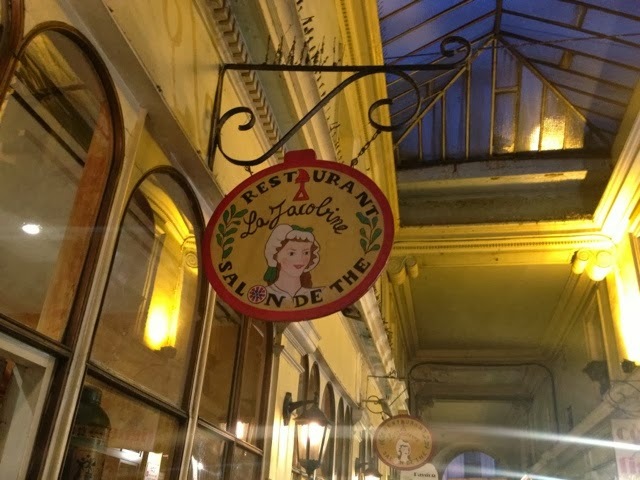 As it turns out, Paris is filled with affordable eating. With pre fixe menus and limited options, you can get a taste for what each restaurants signature dish is, while indulging in classics like French onion soup, creme brûlée, and cheese boards. I gravitate towards the places with long lines, as I imagine what they are serving must be good. At La Jacobine (Rue Saint-André des Arts), I was intrigued by the crowd that surrounded the entrance. While all other restaurants in the area still had empty tables, this place was full. We sat at a tiny table in the corner. For €26 each we had two courses. 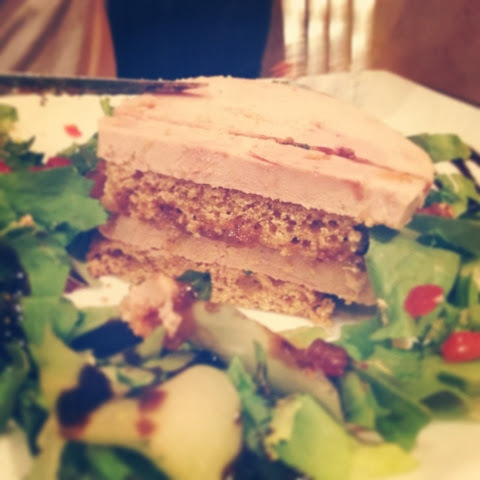 The appetizer came with a generous portion of pâté layered with gingerbread and apricot jam. This combination was incredible, and for this alone I will come back to Paris! 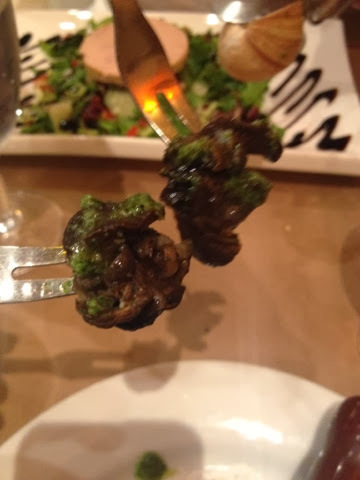 The escargot was hot, buttery, garlicky, and divine. 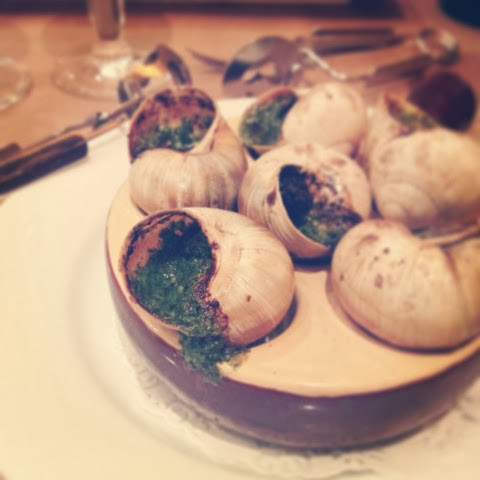 I never had escargot (aside from a french restaurant in the Dominican Republic, does that count?) and this experience set the bar high. Each snail (correct?) was piping hot, not at all chewy like I imagine the slugs on my doorstep to be, and flavored so deliciously in pesto sauce. It was much better off they were doused in sauce to avoid seeing them in their true form. On another note, I got into my car this morning on my way to work to find a slug wedged into the door crack right above the window. It was a big one. I scraped it off with a stick (okay, someone else did it for me) and I drove off with a slimy imprint of this late slug on the side of my car to remind me of that delicious night in Paris where my eyes were opened to another world delicacy.